Cat Boccaccio poses her daring 14 Questions to phographer/blogger, Dantelicia Ethaniel. 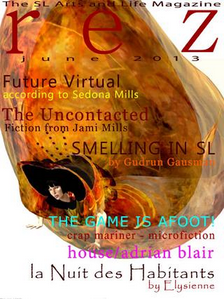 Sedona Mills looks into the future of our virtual selves in The Future of Our Virtual Selves. Elysienne gives us a piece straight from the heart in la Nuit des Habitants. Jami Mills gives writes a short story about a lost tribe in Brazil in The Uncontacted. Gudrun Gausman addresses the topic of alcohol and how it affects our second lives in her piece, No One Smells in SL. Poet Adrian Blair contributes a mighty poem, I Can Not Lift This House. And end with Crap Mariner, who takes us back to when the telephone was invented in his microfiction, The Game is Afoot!